There is no quick way of getting to the island of Jura. The fastest method from London involves two planes, a ferry, and the best part of a day. Coming by car from Glasgow takes about the same amount of time. George Orwell, who came here to write 1984, described it as "an extremely un-getable place." Things haven’t changed a great deal since then. For those who love the great outdoors, Jura is an idyllic place. Its three ‘Paps’ – or mountains - dominate the skyline, distinguishable from miles around and the focus for the tough Jura Fells Race which takes place every May. For those who like to explore, whether by foot, bike, or yacht, there is a wealth of historical sites and natural phenomena to discover; from stone circles and standing stones to ruined castles and iron age forts, from sandy beaches and secluded coves to stacks, pinnacles and caves, as well as raised beaches from the ice-age. Golden eagles, sea eagles, otters and seals are a common sight, and carry on about their business uninhibited by humans. Jura’s exceptionally mild climate has also allowed Peter Cool, the gardener at Jura House, to develop an extraordinary garden within its sheltered walls. Following a trip to Australia and New Zealand 30 years ago, he brought back numerous seeds all of which germinated successfully. Now the garden boasts exotic ferns and grasses which are allowed to mingle with more traditional garden flowers to bewitching effect. Jura is an island rich in history, myths and superstitions. Excavations show it welcomed some of the oldest settlements in Scotland over 8,000 years ago. It also became a Viking stronghold, while its ancient grave-yard at Kilearnadil boasts a number of Knights Templar grave stones and is reputedly the resting place of a saint. The Corryvreckan whirlpool – apparently the world’s second most powerful – nearly claimed George Orwell’s life. Other claims have been made recently to suggest it was the inspiration for Scilla and Charybdis in Homer’s epic, The Odyssey. To the North of the island Maclean’s Skull Cave contained a real human skull, thought to belong to a man slain in a clan battle, which eventually disappeared in the 1970’s. Meanwhile during the highland clearances, a villager prophesised that the last laird of the Campbell family would leave the island one eyed with all his possessions in a cart – which indeed came to pass, in 1938 when Charles Campbell sold the estate after it had been in the family for nearly 300 years and the few possessions he took with him were taken to the boat in a cart drawn by a white horse. 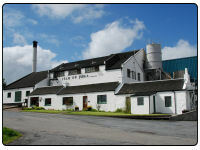 But for true whisky enthusiasts there is one over-riding reason to come to Jura, and that is to visit its distillery. Established in 1810, JURA’s single malts have won numerous awards and are distinguished for their subtle flavours which are dramatically different to the peaty whiskys from the neighboring island of Islay. Often the smallest of factors can affect the balance of flavours in whisky. Although much of a whisky’s character is decided by the type of barrel it is aged in, the finest single malts quite literally offer a taste of their location, starting with the water that is used to the local weather and atmospheric conditions. During the ageing process, the whisky not only absorbs the flavours of the wood, but the island’s atmosphere and sea breezes as they pass over the porous walls of the barrels. Jura’s exceptionally mild climate and gentle breezes, together with the local spring water, are significant factors contributing to JURA’s smooth, warm and complex flavours. JURA offers ten year old, sixteen year old and eighteen year-old single malts, as well JURA Superstition, with a characterful peaty tang. If you’re lucky, and get to meet JURA’s Assistant Distillery Manager Willie Cochrane, you might even get to taste some of his other malts which are currently ageing gracefully in a variety of barrels and hogsheads which include American bourbon and French oak barrels. Occasionally the distillery releases limited edition bottles of these other single malts which are rapidly snapped up by whisky lovers. Jura may be hard to get to, but as those who’ve been there will testify, it’s a place that’s even harder to leave.